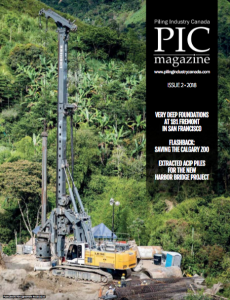 Frank Rausche, PhD, PE, founder of GRL Engineers, Inc., its president for many years and currently a principal and consultant to Pile Dynamics, Inc., has been conferred the title of Diplomate, Geotechnical Engineering, by the Academy of Geo-Professionals. The Academy of Geo-Professionals was founded in October 2008 by the members of American Society of Civil Engineers (ASCE) Geo-Institute, with the goal of providing advanced certification to geotechnical engineers. An engineer becomes a Diplomate through achieving advanced experience, licensure and education. Frank’s certification was presented at a ceremony during Geo-Congress 2013 in San Diego, California on March 4, 2013. Garland Likins, PE, President of Pile Dynamics, Inc. has been announced as the winner of this year’s Robert B. Cummings Distinguished Leadership Award from the Cleveland Technical Societies Council (CTSC). CTSC was founded in 1942 and represents 21 area professional societies and organizations that serve the scientific, technical, engineering and education professions in Northeast Ohio. “The Robert B. Cummings Distinguished Leadership Award is bestowed annually upon an individual who is or has been closely associated with engineering or technical work, and who has contributed greatly to the advancement and welfare of the engineering or technical professions. The individual must have achieved true and lasting prominence over a period of years, and must also have shown community spirit and leadership in worthy non-professional activities. The legendary Frederick C. Crawford received the first such award in 1947”, reads the CTSC website. Garland’s award will be presented on Monday May 6th during the 67th Annual CTSC Scholarship and Achievement Awards Dinner. During that event CTSC will also present $20,000 in scholarships to the brightest Northeast Ohio students – as chosen by their teachers – who plan to pursue science-based careers. The Cleveland Section of ASCE is funding a portion of scholarship in Garland’s honor. PDI has manufactured systems to assure the quality of deep foundations since 1972. A research effort started in 1964 at Case Western Reserve University evolved into PDI, now a 50+ employee company that invests heavily in research and development. PDI engineers hold several patents, and multiple PDI instruments have won innovation awards. PDI is known in all continents for the quality of its state-of-the-art products. Pile Dynamics and its worldwide representatives are committed to providing exceptional customer technical support.